Venez lire et apprécier les nouvelles de la RIDEF 2018 parues dans le journal en ligne. 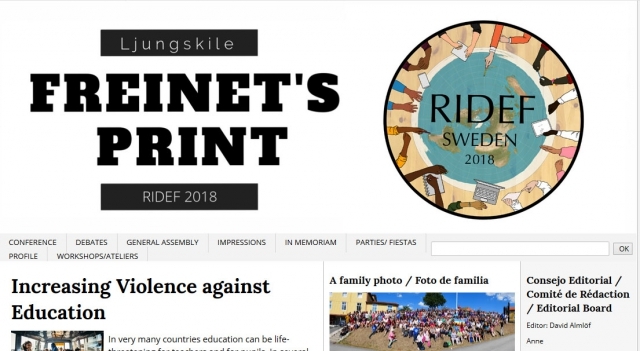 Would you like to lead a long workshop at RIDEF Ljungskile 2018? Send a description of you workshop, number of participants, what language you will use and if you need special equipement. You can write in English, French or Spanish. Send it to mia.vavare@telia.com, before July 31 2017. Atelier long de Genito Lanfranco: VERS UNE CITOYENNETÉ PLANÉTAIRE POUR LA PAIX AVEC LA TECHNOLOGIE DIGITALE. CITOYENNETÉ À LA RECHERCHE D'UNE SOCIÉTÉ PLUS JUSTE.